1. 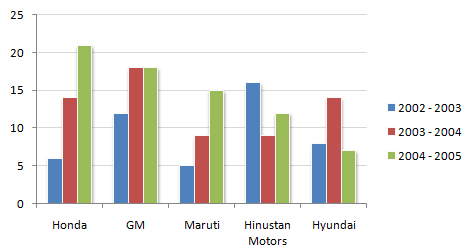 The following chart shows the production of cars in thousands. 2. For how many companies has there been no decrease in production in any year from the previous year ? 3. 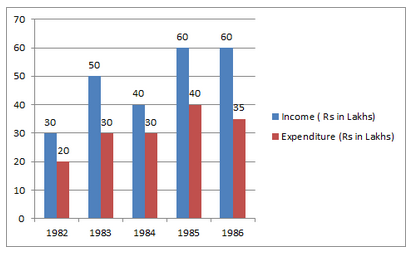 What was the difference in profit between 1983 and 1984? = Rs. 20 Lakhs - Rs.10 lakhs =Rs.10 lakhs. 4. How many years was the income more than the average income of the given years? =Rs. (30+50+40+60+60)/5 = Rs. 48 lakhs. So there is decrease in month of march as compared to that in february. 6. What was the total value of sheet steel (in $) imported over the 6 month period? 7. What was the percentage of scrap steel imported in the 6 month period? 8. What was the difference (in thousands of tons) between coil steel and sheet steel imports in the first 3 months of the year? 9. 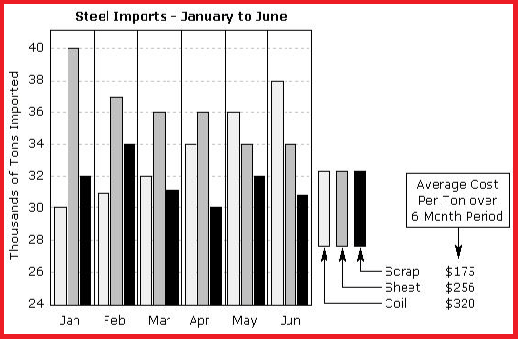 What was the approximate ratio of sheet steel and coil steel imports in the first 3 months of the year? 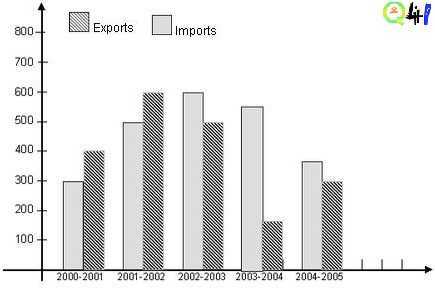 In which of the following year the gap between the import and export was maximum.